$1/1 Barilla Pasta Sauce Coupon! 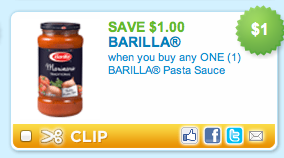 Hurry and print this new $1/1 any Barilla Pasta Sauce coupon! Use zip code 19464, under Foods.